(1) The Siren 250 M10 electronic siren serves to alert the fire and rescue services and to warn the public in the event of an emergency. 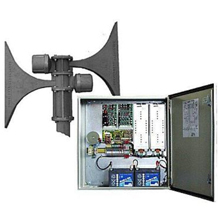 (3) The control unit contains 2 short-circuit-proof, overtemperature-protected low frequency amplifiers with two 125W output power each. (13) A radio control with status feedback, an operating and display panel, a handheld microphone with preamplifier and a digital voice memory with 180 s recording time can be integrated as options in the cabinet. The operating and display panel can also be fitted with a goose-neck microphone and is available in remote from as a desktop or wall-mounted model. (14) The outdoor unit consists of two acoustic radiators with the appropriate flanges and covers. They are made of corrosion-resistant diecast aluminum. All screws and fastenings are made of stainless steel. An antenna carrier can be mounted optionally.